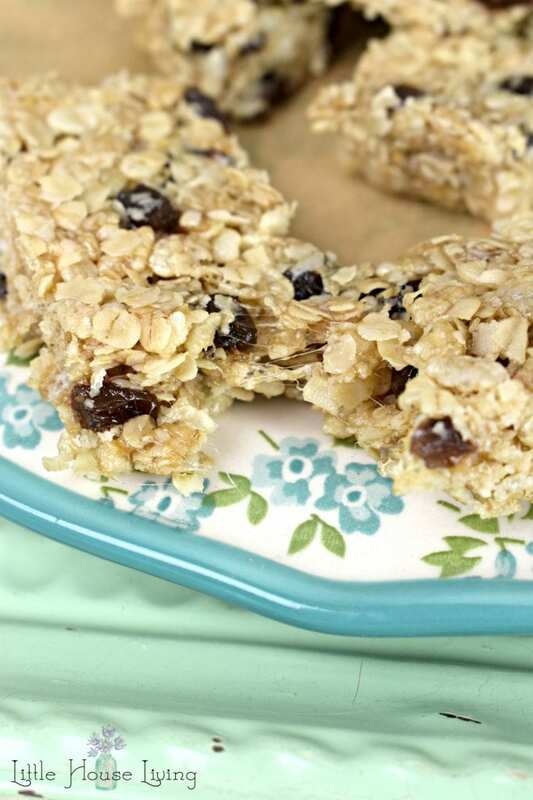 Looking for the perfect chewy granola bars recipe? 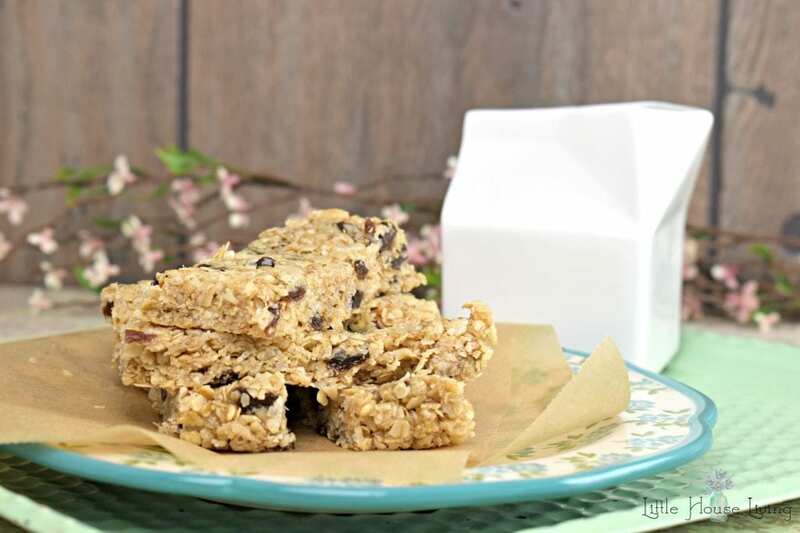 This Oatmeal Raisin Granola Bars recipe might just be the perfect fit! 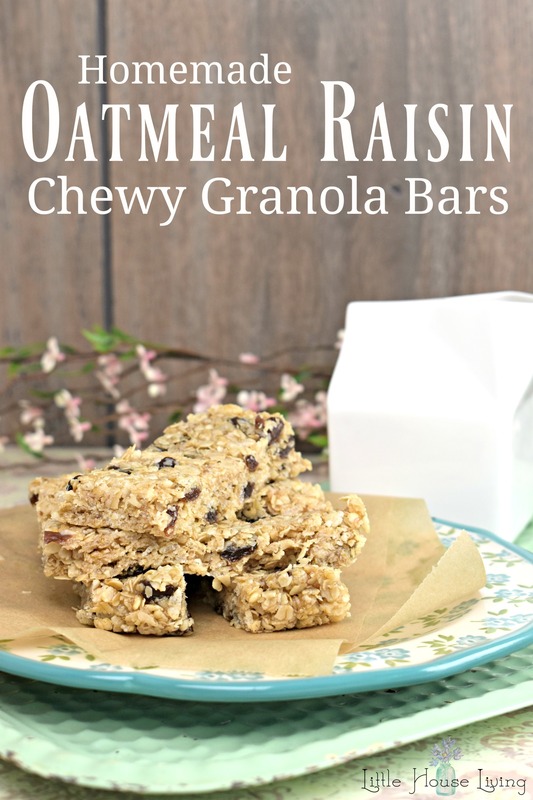 If you love the chewy style granola bars from the store, you will love this recipe that only takes about 10 minutes to make. I love making little snacks for my kids and experimenting with making my own versions of store-bought foods. 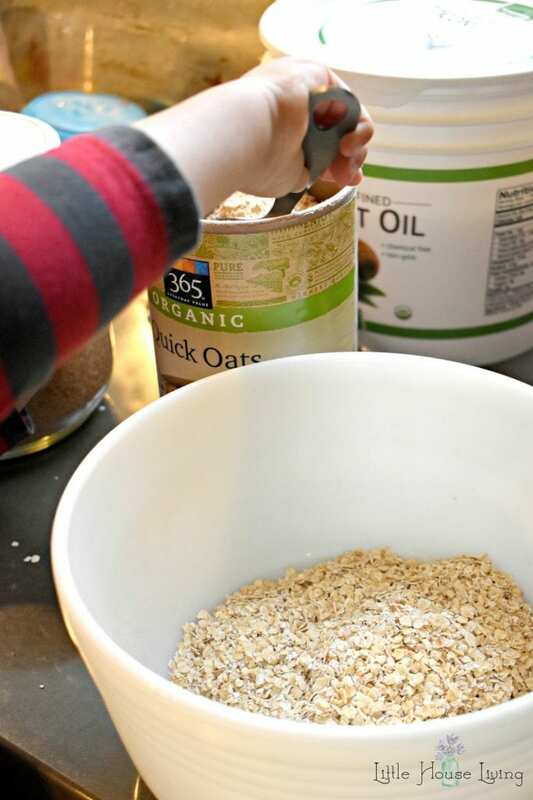 Lately, my boys have been loving granola bars but it’s hard to find them without extra, unneeded ingredients and it’s even harder to find them without chocolate (my oldest claims he doesn’t like chocolate!). This recipe that we came up with is super easy…only about 10 minutes to make not including cooling time. Plus it’s very customizable so if we ever decide we want to add something other than raisins, we can do that. Another great thing about this recipe is that it’s no-bake and nut free! 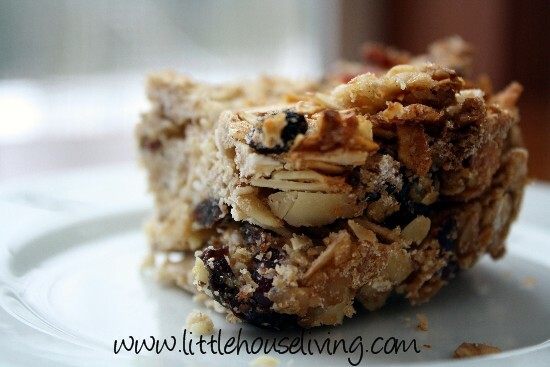 –You might also love my Crunchy Granola Bars Recipe. A few notes on the ingredients. You can use brown sugar or raw sugar for the sugar in this recipe. I used raw sugar. You could also add less sugar or possibly leave it out. I’m still experimenting with that. If you added chocolate chips instead of raisins I would for sure leave out the sugar. I also used a refined coconut oil for this recipe, that’s the coconut oil that does not have the coconutty flavor. If you don’t mind the coconut flavor you can use the extra virgin coconut oil instead. In a large bowl, combine the oatmeal, crispy rice cereal, and the raisins. This is a great recipe to have a helper in the kitchen with. Today my 3 year old insisted on helping Mama make the snack. 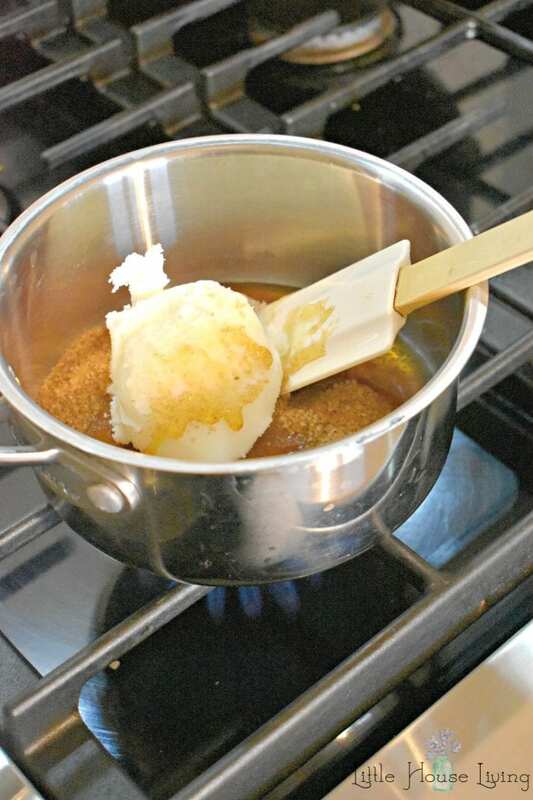 In a saucepan, combine the coconut oil, sugar, and honey. Bring to a boil and boil for a minute or two. After the bars have been in the fridge for a while, remove the pan and pull the bars out of the pan by lifting the parchment paper. Cut into 12 bars. Place in an airtight container and store in the fridge until ready to enjoy. Replace the raisins with any other dried fruit such as cranberries. Replace the raisins with mini chocolate chips (add in last so they won’t melt). Dip in chocolate for a special coating. Use chocolate crispy rice cereal for a chocolate bar. Add in peanut butter chips instead of raisins. Add a few marshmallows in the saucepan with the wet ingredients along with chocolate chips for a “smores” flavor. These are such a fun little snack, my kids love them! They can be made up quickly and are easy to store. You can also double the recipe and put them in a 9×13 pan. 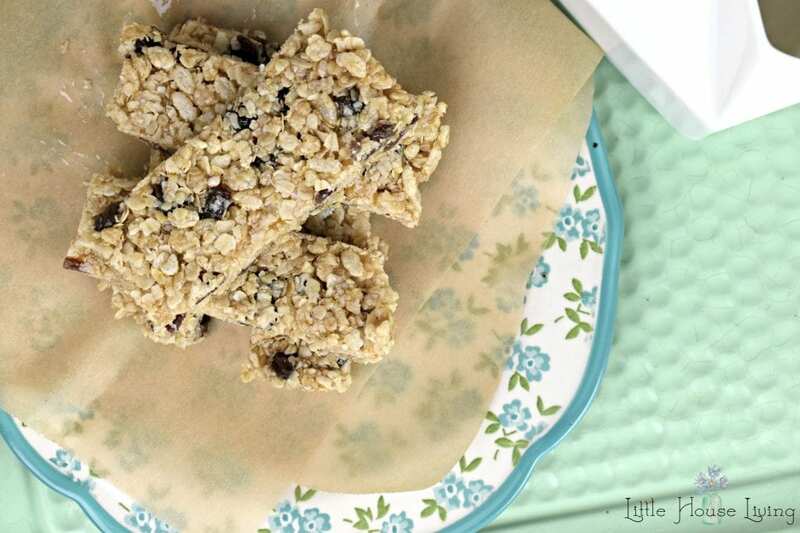 These Oatmeal Raisin Granola Bars can be frozen if you make extras. 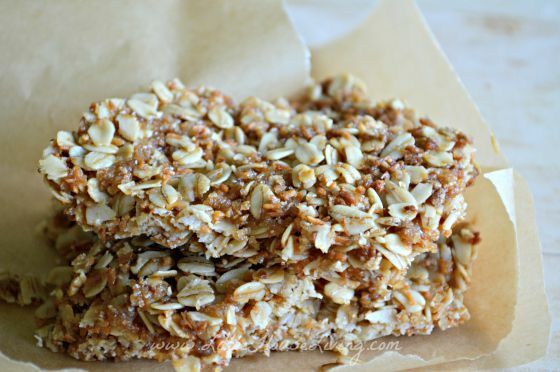 Make your own chewy, crispy granola bars with this delicious recipe! In a large bowl, combine the oatmeal, crispy rice cereal, and the raisins. Pour the wet ingredients over the dry ingredients and combine well. Place a piece of parchment paper in an 8x8 baking dish. 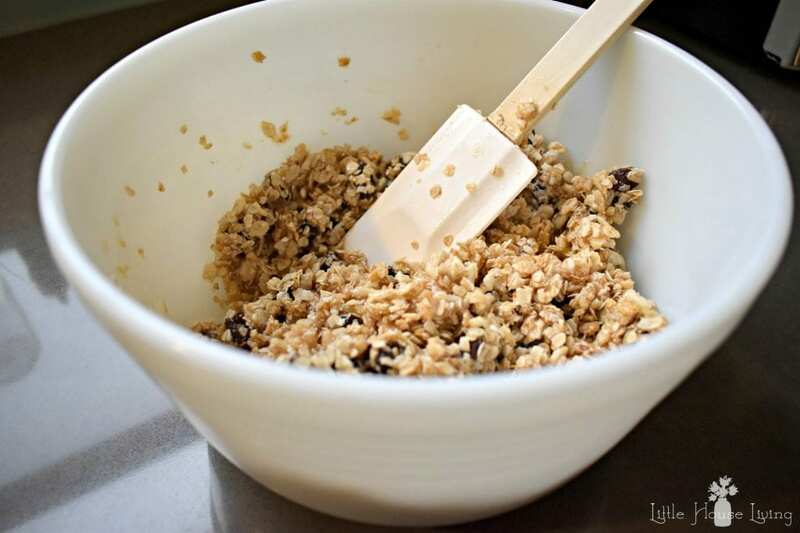 Pour your granola bars mixture into the pan and use a spoon or hands to pat it down tightly into the pan. Place the pan into the fridge for at least 30 minutes to an hour so the bars can set up. How long do Granola Bars last? These Oatmeal Raisin Granola Bars will last for at least a week in the fridge if stored in an airtight container. They can be frozen in a freezer bag or container for up to two months. Only put them in the freezer once they have completely cooled. Once you remove them from the freezer, let them thaw in the fridge before enjoying. How to make Granola Bars stick together? 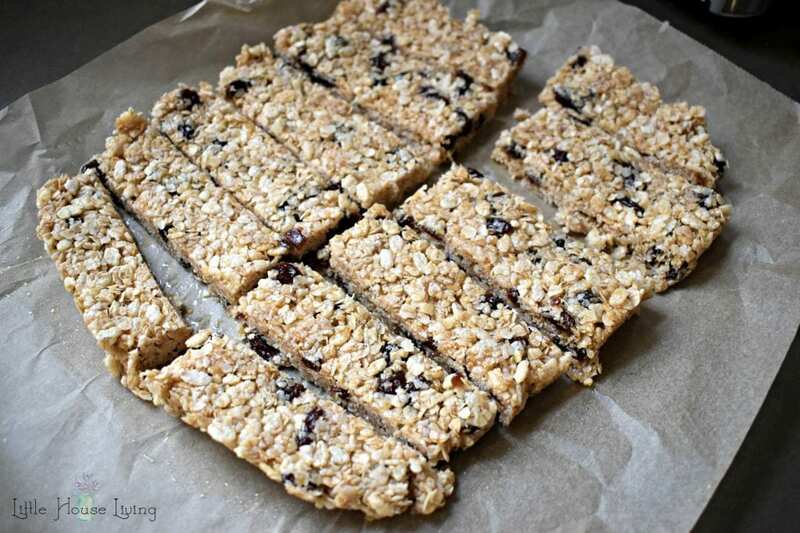 How to make Granola Bars chewy? The key to the chewy granola bars is the quick cooking oats instead of using old-fashioned oats. You will also want to make sure that you don’t boil the honey too long or it may get closer to the candy stage and get a little crunchy. 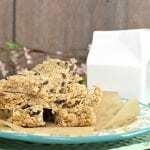 I hope that you will enjoy making this Oatmeal Raisin Granola Bar recipe and that it’s something that the whole family will love! 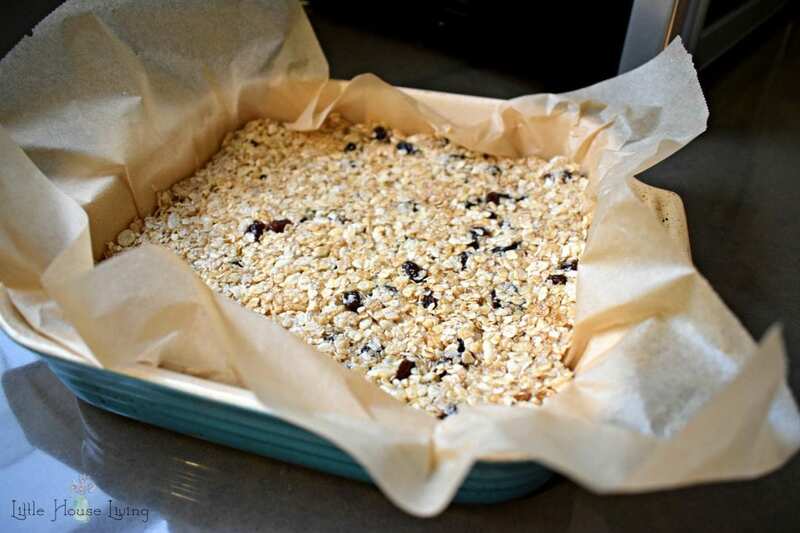 Have you ever made your own homemade granola bars? Thanks for the recipe. I can’t wait to make this! 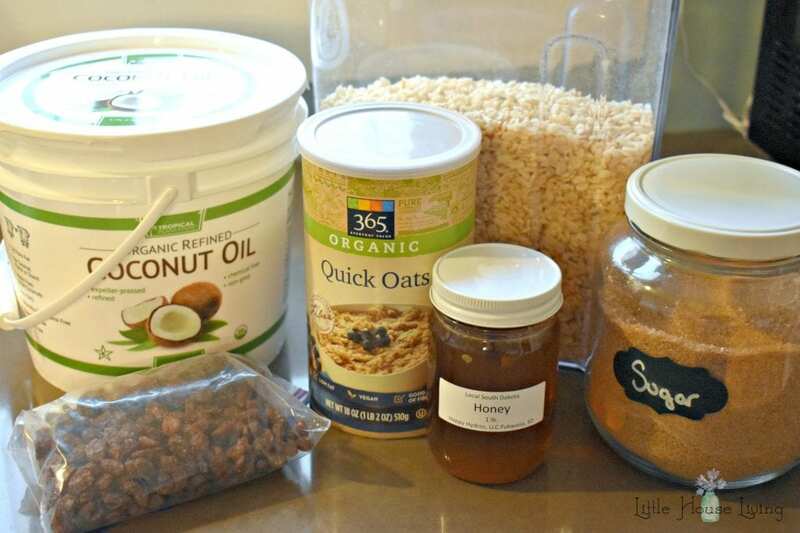 You can use another mild vegetable oil instead of the coconut oil. Thank you for the recipe. We have two full time students here that grab bars of some type before heading out the door to community college. 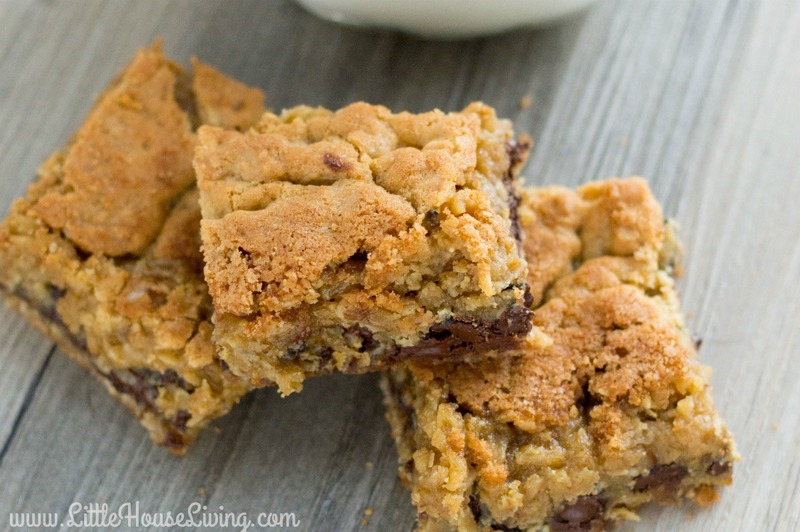 I am trying to find time and recipes to make them homemade bars. I think they are better quality. Nothing compares to homemade! I think I won’t mind Winter too much this year. I think I have finally found time in my schedule to begin sewing apparel and winter fleece blankets. I really, Really, REALLY don’t like coconut. What can i sub for coconut oil? —-i’ve Had people serve me food with it before and yes I can taste it. Thanks. If you use refined coconut oil it won’t have a taste to it. I dislike coconut oil as well but have no problem with this. Otherwise you can try another light vegetable oil that you prefer to use instead. I’m gojng to have to try this. I wonder how it would work out using monk fruit as a sweetener since I’m trying to cut back in sugar. I’m not sure as I’m not familiar with cooking with that but if you try it let us know!